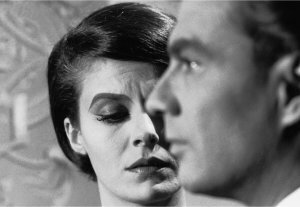 Not just a defining work of the French New Wave but one of the great, lasting mysteries of modern art, Alain Resnais’ epochal Last Year at Marienbad has been puzzling appreciative viewers for decades. Written by radical master of the New Novel Alain Robbe-Grillet, this surreal fever dream, or nightmare, gorgeously fuses the past with the present in telling its ambiguous tale of a man and a woman (Giorgio Albertazzi and Delphine Seyrig) who may or may not have met a year ago, perhaps at the very same cathedral-like, mirror-filled château they now find themselves wandering. Unforgettable in both its confounding details (gilded ceilings, diabolical parlor games, a loaded gun) and haunting scope, Resnais’ investigation into the nature of memory is disturbing, romantic, and maybe even a ghost story. How clearly I recall standing in the rain outside the Co-Ed Theater near the campus of the University of Illinois, waiting to see Last Year at Marienbad. On those lonely sidewalks, in that endless night, how long did we wait there? And was it the first time we waited in that line, to enter the old theater with its columns, its aisles, its rows of seats - or did we see the same film here last year? Yes, it's easy to smile at Alain Resnais' 1961 film, which inspired so much satire and yet made such a lasting impression. Incredible to think that students actually did stand in the rain to be baffled by it, and then to argue for hours about its meaning - even though the director claimed it had none. I hadn't seen Marienbad in years, and when I saw the new digitized video disc edition in a video store, I reached out automatically: I wanted to see it again, to see if it was silly or profound, and perhaps even to recapture an earlier self - a 19-year-old who hoped Truth could be found in Art. Viewing the film again, I expected to have a cerebral experience, to see a film more fun to talk about than to watch. What I was not prepared for was the voluptuous quality of Marienbad, its command of tone and mood, its hypnotic way of drawing us into its puzzle, its austere visual beauty. Yes, it involves a story that remains a mystery, even to the characters themselves. But one would not want to know the answer to this mystery. Storybooks with happy endings are for children. Adults know that stories keep on unfolding, repeating, turning back on themselves, on and on until that end that no story can evade. The film takes place in an elegant chateau, one with ornate ceilings, vast drawing rooms, enormous mirrors and paintings, endless corridors and grounds in which shrubbery has been tortured into geometric shapes and patterns. In this chateau are many guests - elegant, expensively dressed, impassive. We are concerned with three of them: “A” (Delphine Seyrig), a beautiful woman. “X” (Giorgio Albertazzi), with movie-idol good looks, who insists they met last year and arranged to meet again this year. And “M” (Sascha Pitoeff), who may be A's husband or lover, but certainly exercises authority over her. He has a striking appearance, with his sunken triangular face, high cheekbones, deep-set eyes and subtle vampirish overbite. The film is narrated by X. The others have a few lines of dialogue here and there. On the soundtrack is disturbing music by Francis Seyrig, mostly performed on an organ - Gothic, liturgical, like a requiem. X tells A they met last year. He reminds her of the moments they shared. Their conversations. Their plans to meet in her bedroom while M was at the gaming tables. Her plea that he delay his demands for one year. Her promise to meet him again next summer. A does not remember. She entreats X, unconvincingly, to leave her alone. He presses on with his memories. He speaks mostly in the second person: “You told me ... you said ... you begged me ... .” It is a narrative he is constructing for her, a story he is telling her about herself. It may be true. We cannot tell. Resnais said that as the co-writer of the story he did not believe it, but as the director, he did. The narrative presses on. The insistent, persuasive X recalls a shooting, a death. No - he corrects himself. It did not happen that way. It must have happened this way, instead ... .
We see her in white, in black. Dead, alive. The film, photographed in black and white by Sacha Vierny, is in widescreen. The extreme width allows Resnais to create compositions in which X, A and M seem to occupy different planes, even different states of being. The camera travels sinuously; the characters usually move in a slow and formal way, so that any sudden movement is a shock (when A stumbles on a gravel walk and X steadies her, it is like a sudden breath of reality). The men play a game. It has been proposed by M. It involves setting out several rows of matchsticks (or cards, or anything). Two players take turns removing matchsticks, as many as they want, but only from one row at a time. The player who is left with the last matchstick loses. M always wins. On the soundtrack, we hear theories: “The one who starts first wins ... the one who goes second wins ... you must take only one stick at a time ... you must know when to ... .” The theories are not helpful, because M always wins anyway. The characters analyzing the stick game are like viewers analyzing the movie: You can say anything you want about it, and it makes no difference. It is possible, I realize, to grow impatient with Last Year at Marienbad. To find it affected and insufferable. It doesn't hurtle through its story like today's hits - it's not a narrative pinball machine. It is a deliberate, artificial artistic construction. I watched it with a pleasure so intense I was surprised. I knew to begin with there would be no solution. That the three characters would move forever through their dance of desire and denial, and that their clothing and the elegant architecture of the chateau was as real as the bedroom at the end of 2001: A Space Odyssey - in other words, simply a setting in which human behavior could be observed. There is one other way to regard the movie. Consider the narration. X tells A this, and then he tells her that. M behaves as X says he does - discovering them together, not discovering them, firing a pistol, not firing it. A remembers nothing, but acts as if she cares. She thinks she hasn't met X before, and yet in some scenes they appear to be lovers. Can it be that X is the artist - the author, the director? That when he speaks in the second person (“You asked me to come to your room ... “) he is speaking to his characters, creating their story? That first he has M fire a pistol, but that when he doesn't like that and changes his mind, M obediently reflects his desires? Isn't this how writers work? Creating characters out of thin air and then ordering them around? Of course even if X is the artist, he seems quite involved in the story. He desperately wants to believe he met A last year at Marienbad, and that she gave him hope - asked him to meet her again this year. That is why writers create characters: to be able to order them around, and to be loved by them. Of course, sometimes characters have wills of their own. And there is always the problem of M.
- Roger Ebert, 30 May 1999. A brand new 2018 4K restoration of the film, which is very carefully graded. As a result, with the strong density the visuals now convey better ranges of nuances. Image stability is excellent. - adapted from Dr. Svet Atanasov, Blu-ray.com, 11 October 2018. Weblink: Report on a discussion the Wellington Film Society held in 1963, not long after the film's first release in New Zealand.